A community requires a comprehensive effort to educate and monitor healthcare providers regarding opioid prescription practices, to increase access to treatment for substance use disorders, to educate patients on the hazards of opioid use for pain management, and to provide for safe disposal methods. Communities also need a host of other efforts to ensure prescription medicines are solution-oriented and not contributing to the crisis. The following resources offer collaborative ways to develop practical changes to systems that have failed patients who were prescribed opioids and became dependent or developed substance use disorder, as well as tools for informing or identifying required changes unique to your community. Administration’s guide to medicine safety. “Put Your Medicines Up and Away.” Centers for Disease Control and Prevention. Accessed November 2018. “Lock it Up: Medicine Safety in Your Home.” U.S. Food and Drug Administration. Accessed November 2018. Until prescribing of opioids is reduced and remains low, patients are their own best weapon for preventing opioid dependence. Many patients rely heavily on their doctors to know and inform them of all of the risks, but this epidemic has demonstrated the need for all of us to be armed with information. These fact sheets will help patients understand the risks, how to increase safety for themselves and others, and seek alternative treatments. Customized medication fact sheets can include a variety of information promoting safe handling, use, and disposal of categories of prescription medicine. Include tips such as: don’t share your medications, questions to ask your doctor, names of different medications in the category covered, and lower risk alternatives. Statistics can include a mix of data from sources such as the CDC on risks associated with non-medical use, as well as state or local statistics. Information about disposal is best when customized to the location. Alaska has a good example. S.A.F.E. also has fact sheets available on Opioids, Your Pharmacist and Your Safety, and Benzodiazepines. Community pharmacies and clinics are best positioned to share this information in person to answer any questions people may have. Fact sheets can also be offered on local health-focused websites or made available for download. “Treating Pain: What Alaskans Should Know.” Alaska Department of Health and Social Services.Accessed November 2018. “Prescription Medicine.” S.A.F.E. Project. Accessed November 2018. Doctors are increasingly pressured for time in patient visits and may feel as if they don’t have time to go over the risks involved with taking opioids. For patients with a history of substance use disorder, mental health histories, or even at-risk family members, reviewing concerns with doctors is particularly important. When a patient and their doctor discuss these topics along with possible alternatives, it can save lives, prevent dependence and addiction, and potential non-medical use. The Food and Drug Administration has a one-page form with questions to ask your doctor and is a great reminder tool for patients. This opioid-focused checklist can be printed and handed out or posted at doctors’ offices, pharmacies, or prevention, treatment, and recovery services to support protective behaviors. The questions are great for preventing opioid use disorder, as well as for initiating conversations between at-risk patients and their providers. “What to Ask Your Doctor Before Taking Opioids: A Checklist. U.S. Food and Drug Administration.Accessed November 2018. Proper disposal of controlled substances, especially outside of the two national take-back days, reduces non-medical use and abuse. Communities should be aware of local public disposal sites and can use the Drug Enforcement Agency’s search tool to locate public disposal sites for prescription medicine. Communities can include the link to this resource on their websites, fact sheets, or any outreach materials so their citizens know their options for medication disposal the other 363 days of the year. Community leadership may also use the link in real time to start discussions about local disposal options, facilitating discussion about proximity and practical access. “Controlled Substance Public Disposal Locations — Search Utility.” Drug Enforcement Administration. Communities wishing to expand MAT therapy options for those in treatment can encourage healthcare providers to get trained and begin prescribing MAT by expanding knowledge of supporting apps and tools, like this one. MATx empowers healthcare practitioners to provide effective, evidence-based care for opioid use disorders. This free app supports practitioners who provide MAT, as well as those who plan to do so in the future. “Mobile Apps.” Substance Abuse and Mental Health Services Administration. Accessed November 2018. Communities with a gap in treatment options need no-cost ways to equip local healthcare providers to assist in battling opioid use disorder (OUD). The Providers Clinical Support System (PCSS) offers free Medication-Assisted Therapy waiver training (an 8-hour online training and an additional 16 hours for NPs and PAs) and clinician coaching mentoring. PCSS also offers a chronic pain curriculum to clinicians treating patients with chronic pain, including nonpharmacological treatments, all funded by the Substance Abuse and Mental Health Services Administration. These trainings can help physicians, PAs, and NPs prevent OUD by providing additional knowledge about ways to treat chronic pain and can give them the training required to prescribe evidence-based treatment for those battling opioid use disorder. “Education and Training.” Providers Clinical Support System. Accessed November 2018. Healthcare providers are the first line of defense against opioid-related adverse drug events (ADEs). One way to reduce opioid-related ADEs is through targeted training for providers at every level in the healthcare ecosystem. Pathways to Safer Opioid Use is an interactive training that promotes the appropriate, safe, and effective use of opioids to manage chronic pain. This is a free learning tool to assist healthcare providers in connecting with patients to prevent non-medical opioid use and abuse and is based on the opioid-related recommendations in the National Action Plan for Adverse Drug Event Prevention (ADE Action Plan). This training will help healthcare providers (physicians, pharmacists, and nurses) increase their knowledge of chronic pain management and identify increased risk for non-medical use and abuse of opioids. Understanding risks in advance of prescribing opioids, along with alternative pain management options can prevent non-medical use, abuse, and fatalities. Healthcare providers and pharmacists can receive CPE and CME credits for the training, with a post-test option after finishing the course (approximately one hour). This no-cost training is especially recommended for areas where training options and funding may be limited. “Pathways to Safer Opioid Use.” Office of Disease Prevention and Health Promotion. Accessed November 2018. “National Access Plan for ADE Prevention.” Office of Disease Prevention and Health Promotion. 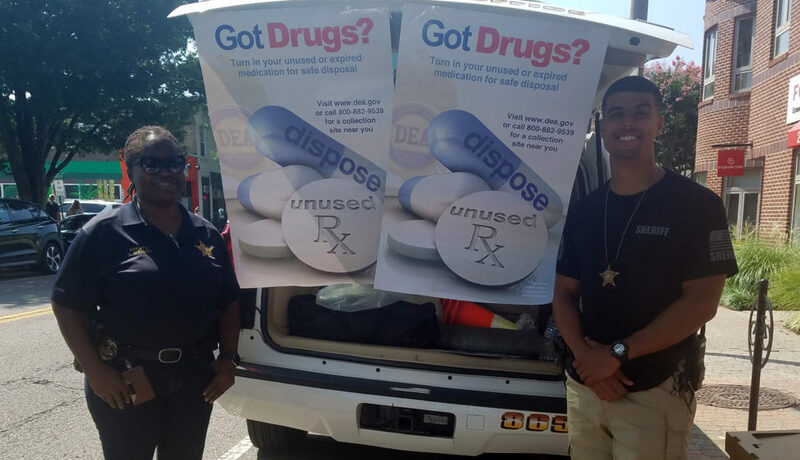 Starting a drug take-back event or program requires coordination across government, private pharmacies, law enforcement, and community members. The Safe Drug Disposal Guide for Communities from the Drug Enforcement Administration and Partnership for Drug-Free Kids is an introduction to the issue of safe drug disposal programs. It is written to help community officials and organizers design a safe drug disposal program for their community, identifying federal guidelines and processes. Each community will need to adapt for its local needs, regulations, and resources, but this is a solid start with a focus on consumers, pharmacies, and law enforcement. “Safe Drug Disposal: A Guide for Communities Seeking Solutions.” Drug Enforcement Administration and Partnership for Drug-Free Kids. Accessed November 2018. The medical community has historically used the Baker-Wong Pain Rating Scale to evaluate a patient’s level of pain. However, it can be highly subjective and variable from patient to patient. To more precisely assess the interference of pain with day-to-day activities and quality of life, the Defense & Veterans Center for Integrative Pain Management with the Department of Defense created the Defense and Veteran Pain Rating Scale (DVPRS). DVPRS is a researched, evidence-based pain rating system (front, back, both) focused on the functional impacts of pain for measure, rather than the more subjective Baker-Wong Pain Rating Scale. The DVPRS is a graphic tool clinicians can use to facilitate self-reported pain diagnoses from patients and is focused on functionality, rather than pain alone, an important shift for improving outcomes and describing pain. Permission is granted for clinicians and researchers to freely use the DVPRS as is, without alteration. If used in revised or altered form, it should not be referred to as the Defense and Veterans Pain Rating Scale. “Defense and Veterans Pain Rating Scale.” Defense & Veterans Center for Integrative Pain Management.Accessed November 2018. Proper disposal of controlled substances is a critical factor in limiting non-medical use and abuse, and more important, can be achieved by anyone with awareness. Labels about disposal offer a segue into conversations with healthcare providers, prescribers, and pharmacists about opioid risk. The National Safety Council offers free opioid disposal envelopes, warning cards, and labels to increase awareness of the risks of opioid use and to prevent non-medical use and abuse. Free envelopes and warning cards are provided for personal use, but communities can purchase and distribute these envelopes as well. Labels are free and can be distributed at pharmacies and medical offices to assist in starting conversations about the risks involved in opioid use. “Order Free Resources to Reduce Opioid Risk.” National Safety Council. Accessed November 2018. While flushing opioids down the toilet does prevent them from being diverted, it creates a new problem for communities when opioids and toxic medications end up in the water system because there are not effective ways to clean or filter them. Communities can mobilize their water treatment programs to increase awareness of proper disposal methods for prescription medicines, which often end up in the water system through flushing or drain dumping. By working with water treatment facilities on education, resources can be aggregated to build awareness that benefits everyone. One way to responsibly decrease opioid prescriptions (particularly among non-chronic pain patients), prevent non-medical use, and promote safe disposal of unused medications is to implement a multifaceted campaign about opioid risks in a hospital, clinic, or primary care group facility. Target audiences should include patients and medical professionals. This type of campaign allows a hospital or clinic system to educate providers, prescribers, and patients simultaneously on the real risk of opioids with localized data and evidence. “Resources.” Use Only as Directed. Accessed November 2018. Many prescribers are unaware they are prescribing abnormally high levels of opioids. The use of PDMP Prescriber report cards is an opportunity for self-examination of a prescriber’s practice as it pertains to the prescribing of controlled substances and provides a more efficient review of patient prescription histories and associated risks. It also opens a dialogue with providers about risk and gives them tools and data to support changed practices, and it is a great first step for communities to embrace. The report cards provide a summary of a healthcare provider’s prescribing history, including their ranking compared with the “average” prescriber of the same specialty and a summary or graphical representation of their prescribing history. The report card may also include a condensed description of patient prescription records, risk status, and other clinically relevant information. Depending upon the PDMP, a report card may be a report requested by the prescriber, or it may be sent as an unsolicited report to a prescriber. Communities and stakeholders can engage with their state PDMP to begin offering this service if they do not already. The PDMP Training and Technical Assistance Program Technical Assistance Guide for Prescriber Report Cards, commissioned by the Bureau of Justice Assistance at the Department of Justice, includes case studies of three states (Arizona, Kentucky, and Ohio) that implemented prescriber report cards. “Prescriber Report Cards.” Prescription Drug Monitoring Program. Accessed November 2018.